In the yoga tradition, the founding texts spoke of the in-breath and the out-breath as two reins that can be used to guide and tame the wild horse of the mind. They prescribed the breath control techniques below, known as “pranayama,” and recommended that we practice them at the beginning of a meditation session, or any time we would like to get mental clarity. Usually only one form of pranayama is practiced during a session. Never force the breath. If dizziness or hyperventilation occurs, simply return to your natural breathing. There will be times when, during or after the practice of pranayama, the breath naturally ceases briefly. If that happens, let it be. Here are some simple descriptions of the breathing techniques we may practice during our meetings. After trying a technique, take care to NOTICE what happens to the movements of the mind. The diaphragm is a large muscle that separates the lungs and heart from the other abdominal organs. To breathe from the diaphragm, we may begin by EXHALING fully, and holding the out breath for a slow count of three. (After practicing for a while, you can eliminate the counting if you wish.) During the phase of held exhalation, your diaphragm muscle is contracting. When ready, relax and allow the air to flow deeply and freely into your lungs. Let the abdomen extend to accommodate the fresh energy. Feelings of joy, calm, and gratitude may come naturally as you let the air in, or, you may actively draw the breath with positive feeling or simply mentally repeat positive words as you breathe. This triggers positive emotional chemistry that becomes absorbed into the cells of the body. Here we practice as above, but after breathing deeply in, GENTLY hold the breath while extending the abdomen outward. You will feel the diaphragm stretch. Then release the air easily and calmly. Try three repetitions of this pranayama. In this technique, we close off the alternate nostril to inhale and exhale on one side before doing the same on the alternate side. We can do approximately five on each side. First exhaling fully, purse the lips, then draw the breath through the mouth, allowing the air to rush across the tip of the tongue. You will feel the coolness of the air as it enters the body. You may wish to hold the air in the lungs briefly, as in “Kumbhak” above. Allow the out-breath to release fully and calmly. Repeat two more times. As opposed to the above cooling breath, this one is considered a ‘heating breath’. As with all breath techniques, it should be practiced gently, without any forcing whatsoever. IF you feel dizzy or uncomfortable while practicing Bhastrika, discontinue. Prepare by blowing your nose thoroughly : you will be exhaling powerfully though both your nostrils. Breathe normally in, then, using the diaphragm muscle, expel the exhalation in short, quick bursts. Try 8, 12, or 20 breaths, then breathe in fully and as always after pranayama breath techniques, take a moment to turn your awareness peacefully within. This is not a pranayama or breath technique per se, but an easy way of training the mind on the breath even more precisely. It helps develop a fine focus that really makes meditation enjoyable and more powerful. It is also a way to re-focus on the breath when the mind has wandered. Simply pay attention to the entirety of the in-breath, then, find the brief moment BETWEEN the in-breath and the out-breath. There may be no pause between the breaths, but rather a moment of transition. In the same way, stay with the out-breath all the way, and try to catch that elusive moment just before the in-breath gets underway. There will be different ways to experience this “space between the breaths,” either as a real pause or as a flowing transition. The benefit of the practice lies in making the attempt. Don’t worry about results. Even a ‘mustard seed’ worth of this subtle focus can give great results. 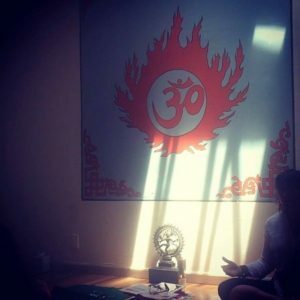 When we use these breathing awareness techniques we are training, cleansing and quieting the mind. A principle of yoga is that a little goes along way, if you practice consistently. Try to enjoy Two 10 minute sessions of quiet meditation a day, or one 20 minute session. You will see results in the way you handle the stress of the day. Great Article ! Pranayama is a great technique when done properly under the guidance of master. I have been practicing this for quite a while and see a great improvement in my overall health.